New for 2019 includes: wood-style flooring on first and top level, White Quartz countertops, shaker style two-tone kitchen cabinets and upgraded plumbing and light fixtures in the kitchen. Nicely decorated with GE stainless steel appliances, custom wood window blinds and treatments. This beautifully built, designer-decorated home offers all the amenities you need for a relaxing and enjoyable vacation. 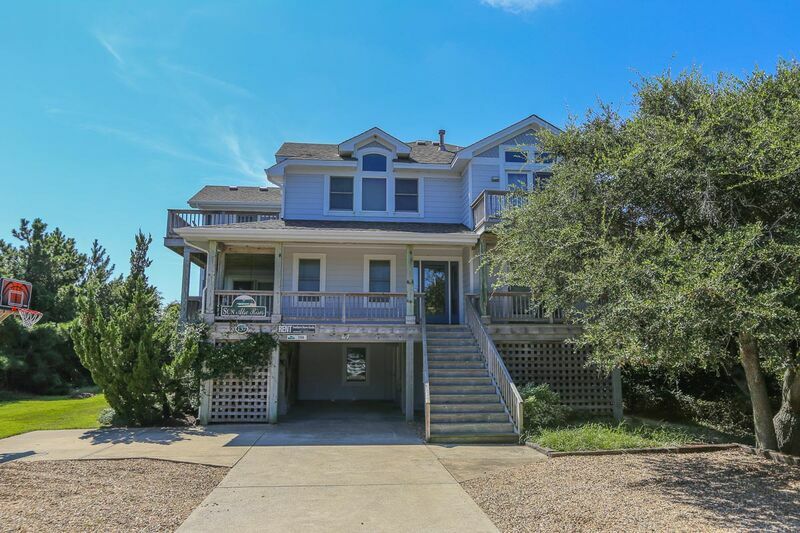 This home features an elevator, six bedrooms, five bathrooms and two half baths, private pool, hot tub and a screened-in porch. All this while resting on a quiet family friendly road, within 200 yards to the beach. Located near the heart of Duck, local shops and restaurants are within walking or biking distance. Recreation room with flat screen TV, DVD player, surround sound, outdoor speakers, kitchenette with full-size refrigerator and separate icemaker. Master bedroom (with Queen with TV and private bath). Half bath accessible by pool, laundry room. 4 bedrooms (2 master bedrooms with King; 1 with Queen; 1 with Pyramid bunk and Bunk set). Outside decks accessible from all bedrooms and all bathrooms have tiled floors. Den/office with provision for wireless internet access. Large living room with flat screen TV, DVD player. Dining room table with ocean views, kitchen with stainless steel appliances and granite countertops. Master bedroom (with King, private bath and tiled shower). Furnished decks and screened porch with picnic table.